How to view the comment count for each site in a WordPress multisite with Beyond Multisite? Are you looking to find out what is number of comments in each site in a WordPress network? This can be done with Beyond Multisite by previewing a comment deletion task with the Cleanup module. We can see all comments or choose some criteria to filter the search. For example only older comments can be … Read moreHow to view the comment count for each site in a WordPress multisite with Beyond Multisite? How to bulk delete revisions in a WordPress multisite with Beyond Multisite? Revisions in WordPress are old versions of posts and pages. They can be useful but they can also pile up pretty fast and take up database space. The Cleanup module of Beyond Multisite offers a smart and easy way to bulk delete revisions in a WordPress network. It is smart because you can target only … Read moreHow to bulk delete revisions in a WordPress multisite with Beyond Multisite? How to view the revision count for each site in a WordPress multisite with Beyond Multisite? The Cleanup module of Beyond Multisite can be used to delete, but it can also be used to get information. For example we can view the number of revisions in each site in the WordPress network. To do this we will just preview a revision deletion task and not execute it. 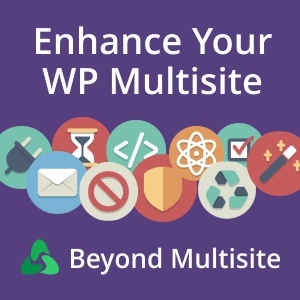 Follow these steps: From … Read moreHow to view the revision count for each site in a WordPress multisite with Beyond Multisite? How to bulk delete sites in a WordPress multisite with Beyond Multisite? With Beyond Multisite and its Cleanup module we can easily bulk delete thousands of sites from the WordPress multisite network. They can be selected by various criteria like their ID, their attributes, when they were registered or updated, and so on. The deletion can be done now or to be scheduled in several days, during … Read moreHow to bulk delete sites in a WordPress multisite with Beyond Multisite? How to find all noindex sites (that discourage search engine indexing) in a WordPress multisite with Beyond Multisite? With the Cleanup module of Beyond Multisite, we can find all sites that discourage search engine indexing. We will use the preview site deletion button in the site deletion form. Follow these steps: From the Network Admin Screen click on Dashboard -> Network Cleanup Scroll down to the Delete Sites section and set the form … Read moreHow to find all noindex sites (that discourage search engine indexing) in a WordPress multisite with Beyond Multisite? How to find old and empty sites in a WordPress multisite with Beyond Multisite? We can use the Cleanup module of Beyond Multisite to find empty, old sites in the WordPress network (and delete them if we want). By an empty site we could mean a lot of things. Currently the plugin can find empty sites that at the same time: have zero published posts and pages, (or with … Read moreHow to find old and empty sites in a WordPress multisite with Beyond Multisite? How to find all deleted sites in a WordPress multisite with Beyond Multisite? Thanks to the Cleanup module of Beyond Multisite we can view a list of all the sites in a WordPress multisite, that are marked as deleted (they have the deleted attribute). To do this we will preview a site deletion task, but we will not execute it. After you install and network activate the plugin, … Read moreHow to find all deleted sites in a WordPress multisite with Beyond Multisite? How to find all sites marked as spam in a WordPress multisite with Beyond Multisite? Using the Cleanup module of Beyond Multisite we can generate a list of all the sites in a WordPress multisite, that are marked as spam (they have the spam attribute). We will do this by previewing a site deletion task, that we will not execute. After you install and network activate the plugin, and turn … Read moreHow to find all sites marked as spam in a WordPress multisite with Beyond Multisite? How to add a captcha on the blog signup form in a WordPress multisite with Beyond Multisite? With the Captcha module of Beyond Multisite you can protect all built in WordPress forms, including the multisite blog signup (wp-signup.php) form. After you install and network activate the plugin, here are the next steps to take: From the Network Admin Screen click on Beyond Multisite Click Show Settings in the Captcha module box The … Read moreHow to add a captcha on the blog signup form in a WordPress multisite with Beyond Multisite? Here are two methods by which you can install and activate Beyond Multisite on your WordPress Network. Learn about the plugin modules, how to turn them on and off, and how to manage their settings. Read instructions on controlling the access to plugins by site administrators and learn how to bulk activate/deactivate plugins. Learn how to bulk delete unwanted comments, revisions, and sites with the Cleanup module of Beyond Multisite. See how to easily duplicate a whole site (including all content, settings, files and users) from the multisite network. Here is how you can see on which sites a plugin or a theme is activated. Learn how to view and manage all the users that have not yet been activated. Learn to ban unwanted users and their IP address from leaving comments, signing-up or logging-in. See instructions on how to insert HTML code globally for the entire WordPress network or for some chosen sites only. Learn how to protect your WordPress forms, including the one for blog signup, from spam bots with a captcha image. Read all about how to send mass emails to some or all users in a WordPress network.